Add custom ringtones to OS X. Is there a better alternative to Ringtone Adder? Is Ringtone Adder really the best app in AppleScript category? Will Ringtone Adder work good on macOS 10.13.4? 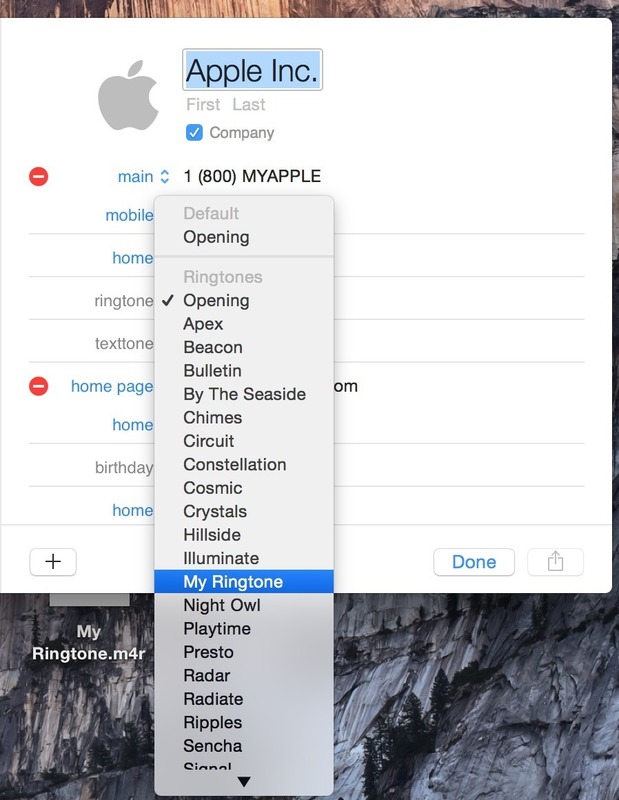 Ringtone Adder adds your ringtones to OS X's list of system ringtones. OS X 10.10 Yosemite and later versions let you change the ringtones and text tones that play when your contacts call or message you, but you can only choose from the ringtones that come with OS X. This app lets you easily add your own to the list. All you need is a .m4r file. This way, when you receive an iMessage or SMS, or receive a FaceTime call or phone call, you can have your own ringtones play. After you run Ringtone Adder, you will be able to go into the Contacts app in OS X, edit a contact, and see your ringtones appear in the "ringtone"
OS X 10.10 Yosemite and later versions let you change the ringtones and text tones that play when your contacts call or message you, but you can only choose from the ringtones that come with OS X. This app lets you easily add your own to the list. All you need is a .m4r file. This way, when you receive an iMessage or SMS, or receive a FaceTime call or phone call, you can have your own ringtones play. After you run Ringtone Adder, you will be able to go into the Contacts app in OS X, edit a contact, and see your ringtones appear in the "ringtone" and "text tone" dropdown menus. Have you ever purchased tones for your iPhone via iTunes on your Mac, and wish you could use them on your Mac, too? You can with Ringtone Adder. When the application opens and you choose "Add", just point it to this folder: ~/Music/iTunes/iTunes Media/Tones. The ~ symbol represents the path to your user folder.